Inflation remains predominantly absent, with inflation rates excluding energy and typhoon-affected fresh foods at only 0.1% year-on-year. But the authorities are choosing to focus on the broader core measure, which excludes only fresh foods. Thanks to higher oil prices, this is a relatively robust-looking 1.2%. Though not for long. 1.2% is still way off the official 2.0% target. But it is sufficiently close for the Bank of Japan (BoJ) and government to suggest no pressing need to chase this further. BoJ policy, according to Governor Kuroda, will eventually be altered through changes to the 10-year Japanese Government Bond (JGB) target. With the target currently at 0.1%, the benchmark issue was recently trading at about 0.14%. A fairly rapid reversal has taken it back to 0.1% in recent weeks. No hint, therefore, that a change in the target yield value is being planned imminently. Equity markets in Japan have not been immune to global forces. The Nikkei 225 is down more than 7% year-to-date in yen terms, with the broader TOPIX index down 12.4%. This compares with a fall of only 0.6% YTD in US dollar terms for the S&P 500. 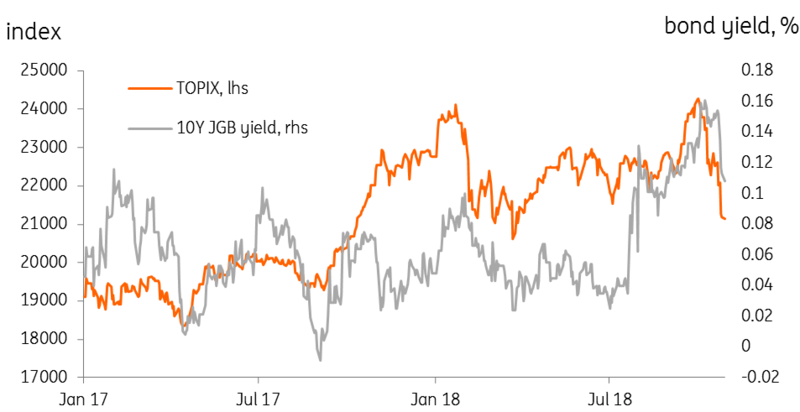 This might explain why the 10-year JGB yield has been brought back into line with the official target, instead of being allowed to drift higher. Japan’s Prime Minister Shinzo Abe has used his re-election as head of the LDP to pursue a pattern of relationship building in the region. A state visit to Beijing should not be viewed as merely cosmetic. 500 business deals were signed on the trip, valued at about ¥260 billion, and including a $30 billion currency swap arrangement with China. The trip also marked an end to Japanese foreign aid to China, but a commitment to partnership in infrastructure projects, including the Belt Road Initiative, which Japan has avoided until now. The rapprochement with China is significant, as it signals a choice between good relations with China at the potential expense of those with the US. Abe won’t want to sour Japan’s relations with the US, but he can’t afford to take sides with the US against China, even if that may incite a reaction from President Trump. Rather than driven by emotion, Japan’s actions come across as reassuringly pragmatic. 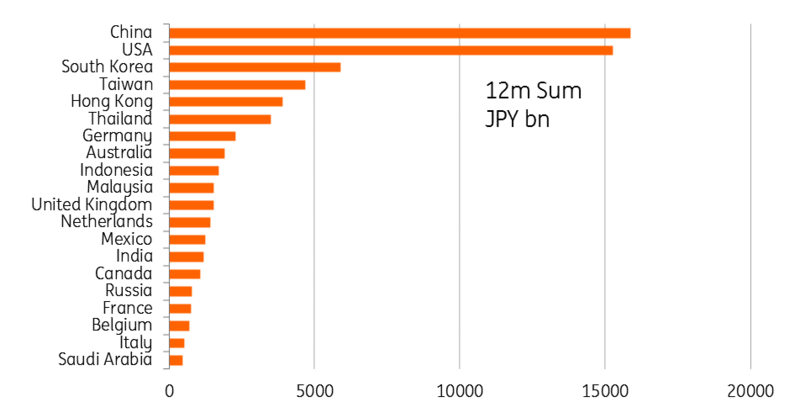 In the last 12 months, Japan has exported more to China than the US, and China is Japan’s number one unique export destination. As recently as six months ago, the US had the top spot. The US now holds second place followed by South Korea, which absorbs almost a third as many Japanese exports as the US, followed by Taiwan, Hong Kong, and Thailand. It is only then that the rest of the G-7 becomes involved, as Germany enters the ranks, and then we are quickly back to the Asia Pacific region with Australia, Indonesia and Malaysia. In short, in the words of Barack Obama, it looks like Japan has tilted towards Asia.